*I went to the supermarket on Tuesday and the area closest to me to place my trolley was full with people chattering, taking or putting back trolleys that I decided to go to the opposite side as it was empty. I was putting my things away before I took my niece out and noticed a lady glance at something and look away. 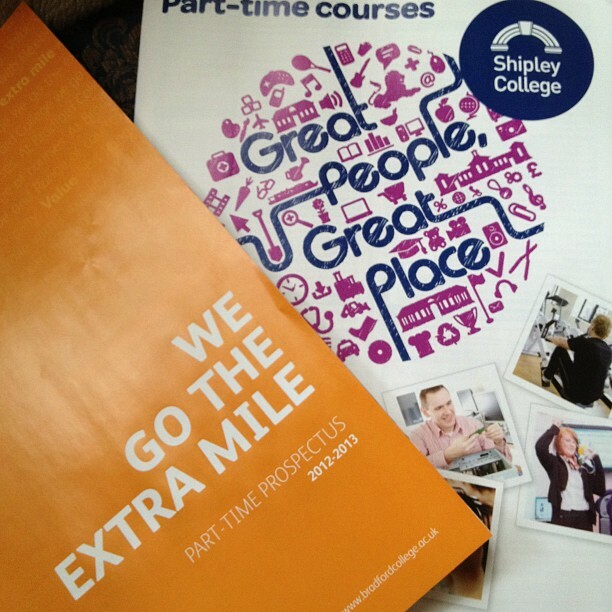 It caught my attention and it was these 2 Prospectuses for part time courses at 2 different but local colleges. I picked them up and think it maybe a sign that its time to apply for something. I'm going to start with my maths as its something I really want to get even though I hate the subject. *When I don't want to get out of bed in the morning, it usually means that its going to be a hectic day and one where I can't get my mind to do what I want it to. *When I stop in every red light on the way to somewhere its mostly a sign to turn round and go back home. *When the sun is shinning through the window and I feel calm and relaxed even though its 5am, I know its going to be a good day. *When time doesn't feel like its flying by and I'm content, its going to be a day where I feel I've accomplished a lot. *When I feel an itch to check the back of the book to see if my favourite characters in a book will get together, I know its going to be a great book. That feeling is becoming less and less now with having a kindle as I'd lose my place if I tried to go to the end to see so I keep reading. *When time in the morning before work doesn't feel long enough, I know that the day will end before I know which isn't such a bad thing even though I feel disorganised. What do you think are signs leading to good or bad things? I think the part time courses are a great sign! It is never too late to educate yourself and change things!! I need to phone up and find out more, it was just by chance I saw these. Its amazing though as to how expensive these courses have become though. Oh! I agree with that, bad sleep bad day/cranky day. I agree sooo much on this one: "When I stop in every red light on the way to somewhere its mostly a sign to turn round and go back home." But I don't really notice those kind of signs in my life, I must admit. Elisse I don't normally pay attention either but I thought that must be a definate something to have come across those booklets when I've really been considering studying lately. It then got me thinking about other things that maybe a sign to something... I'm curious to see what others may write. You should try out those courses, as well as expanding your mind, you will also meet new people. I really will megan as its something I started when I was 21, I applied and got in to a photography course and sign language course which I loved but I was due for an operation so didn't the following year and then life just tumbled down hill. 10 years later and I'm going to try again but hopefully this time things will go upwards so that I can move on to the next thing after my maths (which I hope I will pass!). I hope that time will pass of bad sleep. I usually find I'm like that in holidays even when I've been busy all day.